Accountabiity is one of those words that have almost been overused to death...much like the word of the 90's: integrity. It's unfortunate because both are really great words that convey so much meaning. They have almost ceased to be effective because we've heard about them and their importance so much. 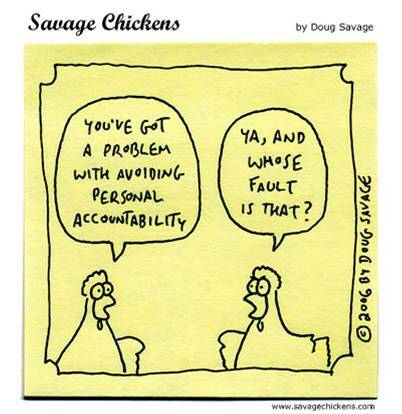 However, in my opinion, if there was ever a time that we need accountability, it's now. We live in an age of "whatever works for you, do it" and "whatever you think is right, well, it's right for you." Well, I don't know about you, but I don't really trust myself that much. See, I know myself. I know my tendencies towards what's best for me and my ability to be blinded to the needs of others. Plus...that argument for doing "whatever you want," in the spirit of personal freedom usually nets you the "what you want," but many times ends up encroaching on someone else's freedom. For example, my right to "speed and not stop at stop signs properly," may net someone getting mowed down in the crosswalk. And even worse, someone's right to "express their sexuality how they want" may cause someone else to be sexually exploited or victimized. See...we're really not that great at times at policing ourselves or being able to honestly see the areas we might need to do some work on. As for me, I find that the older I get, the more I desire and crave genuine and soul-deep friendships. I'm not saying that it's not great to have friends that are "just fun to be around," or "shopping buddies," etc. There is room for all of that in my life. However, at the very core, I need friends who are willing to roll up their pant legs and wade into the muck of my life. And, for them to do that, it requires one thing: honesty. I have to be honest with them about the things that I struggle with...and I mean the really ugly stuff...not just the "I have a problem with caring too much or working too hard" stuff that really tries to end up making us look good. And in return, I need people to be honest and say, "I think you're making a mistake here," or "I don't know if you are aware of this thing you do, but...." However, this doesn't occur naturally. We instinctly try to cover our blemishes and faux pas. After all, it's in our genetic make-up....didn't Adam and Eve try to cover up their nakedness and hide from God? Deep down we're afraid that if anyone got a really good look at what's truly underneath it all, they would run screaming...or worse, shake their heads in disgust and tell us what we already know about ourselves. And that's the dichotomy of accountability. To make it effective, we have to be vulnerable. To be vulnerable, we run the risk of being wounded. But, at it's best, we are challenged to make a change, to correct a wrong, to be better than we can be on our own. Frankly put...we need each other. You see, I think that deep down, people are hungry for this. They want to know that someone cares enough about them to point out potential trouble spots. After all, what kind of friend wouldn't shout out a warning to the friend they saw standing in the path of an oncoming vehicle? Does that mean I want just anyone coming up to me saying, "You need to work on your anger issues"? Probably not...although in a perfect scenario, I certainly should be able to hear that and digest it rather than jumping on the offense. Yes, it can be difficult at times to hear a friend's corrective advice. We can feel attacked or picked upon. However, I would argue that it works when you are in a friendship that is based upon mutual respect, grace and trust. In this type of relationship, suggestions would be welcomed as part of the process of growth. Q1: What do you see in my life that encourages you? Q2: What do you see in my life that you'd like to caution me about? Q3: Is there anything else you would like to tell me? What is attractive to me about this process is that when we ask these questions, we are inviting someone to crawl inside our very soul. It can be awkward at first if you are not used to it, but I think you'll find the incredible joy of knowing and being known. It's what we all crave.